We're proud to introduce our new brand identity, featuring a redesigned modern logo, symbolizing our company's development and transformation while maintaining its connection to our foundation. For over 40 years, Pacific Medical Buildings, or PMB, has concentrated exclusively on the design, construction, and development of healthcare facilities. PMB Real Estate Services was formed by PMB to ensure personalized and enhanced service levels to specialized medical tenants. PMB RES has since grown to become a leader in the industry with the management of over 3 million square feet of medical office space in 6 states. "It's a bit of a story that started with American Medical Buildings (AMB), PMB's predecessor. AMB was started in Madison, Wisconsin in 1960 with the name Midwest Professional Buildings, or Midwest. My company, Fritz and Rosenthal Architects, was the consulting architect for Midwest and designed all of its buildings. One day, the President of Midwest decided to change the name of his company and wanted a new logo for which he offered a $1,000 prize ($8,000 in 2014 dollars). My design won. My thought was that the cross had some resemblance to the Red Cross which indicated healthcare and the red square in the lower right corner further reinforced that idea. In 1988, I purchased the West coast division of AMB, changed the name to Pacific Medical Buildings, and changed the red square in the corner to blue, representing the Pacific Ocean." Today, many associate the blue square to represent the "on-campus" medical office building of the Hospital that is signified by the cross instead of the ocean as we have spread our reach beyond the Pacific Coast. 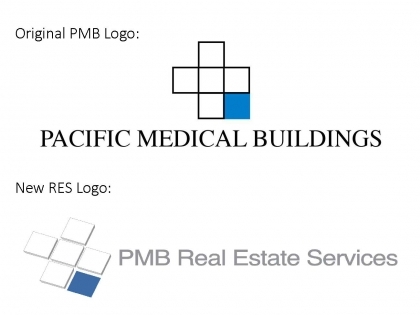 PMB Real Estate Services is proud to continue the tradition of Pacific Medical Buildings while striving to be the best property management company in healthcare.